One of my favorite comfort foods of all time is peanut butter. There’s just something about the rich, creamy taste of peanut butter that makes me smile. Just about the only way you could improve on peanut butter is by adding it to chocolate. These delicious brownies combine the tastes of both chocolate and peanut butter into one dessert that will definitely make you feel better no matter what type of day you’ve had. 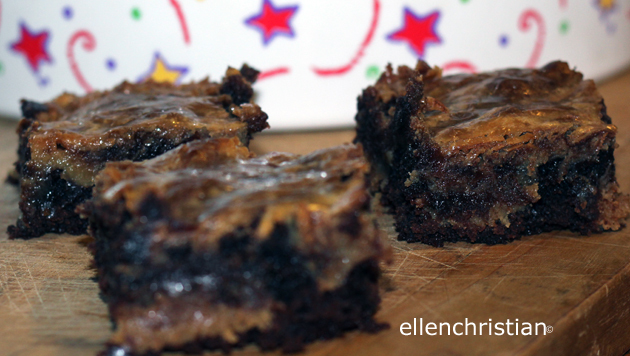 I just know you will love this Peanut Butter Brownie Recipe. Mix the brownie mix according to the manufacturer's directions on the box. Combine sweetened condensed milk, peanut butter and flavoring in a bowl. Pour the brownie mixture into the prepared pan. Pour the milk mixture on top of the brownie mixture. Using a knife, swirl through the brownie batter to create a design. Bake according to package direction adding 4 minutes to make up for extra batter. Test for done-ness. Allow to cool completely before cutting. YUM! These brownies look so good! Two of my favorite things; Peanut butter and chocolate! Oh yum! I want to try this. You got me at peanut butter and brownie! Delicious! Those should be against the law! Two of my favorite things! It’s like a Reece’s! YUM! You simply cannot go wrong with peanut butter and chocolate. Looks so yummy! This looks so unbelievably good! Thanks for sharing! Those look like the most delicious brownies I’ve ever seen. That is how my family likes them. Nice and gooey. However, I can’t have peanut butter anymore. It gives my migraines. So sad because I love chocolate and peanut butter. that looks heavenly! Now I’m hungry! Looks out of this world! Would love to try it when I’ve got some spare time! Yum, that looks so gooey!